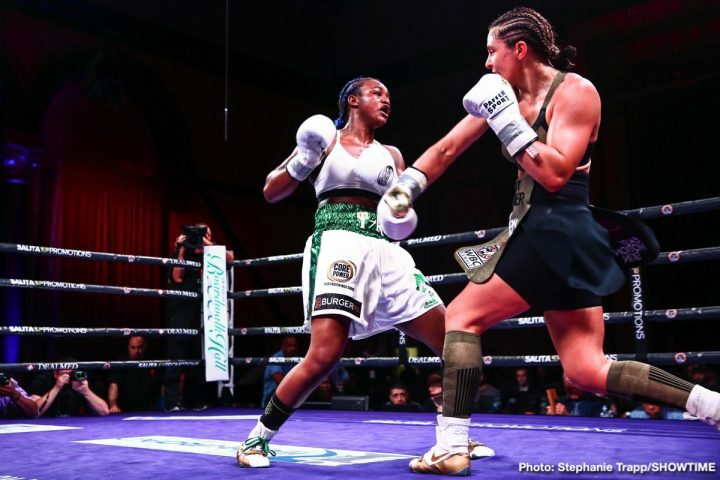 By Eric Coronado Jr.: Last weekend we saw Claressa Shields (9-0-0, 2 KOs) masterfully dismantle long-time undefeated champion Christina Hammer, who now has a record of 24-1-0. Considering Shield’s accomplishments as a two-time Olympic gold medalist, and Hammer’s impressive reign as WBO female middleweight champion, this event should have been one of the biggest fights of the year. What viewers received, however, was a lackluster undercard and ten, two-minute rounds of action that left veteran boxing fans desiring more. A future where women headline boxing’s pay-per-view events is simply unrealistic without the short-term goal of increasing the length of time and the number of rounds that women have to fight. During the second annual Women’s boxing Convention last year in Tijuana, there were over 40 fighters present during the presentation by Dr. Choe from UCLA. She emphatically described, with facts, how the bone structure of women is different than men, specifically in the neck region. She also stated that women have almost 80 percent more concussion probability than men. A concussion or fatal accident is deemed to happen when an athlete is dehydrated and fatigued, and they have a slower recovery time. There is a simple formula: DEHYDRATION + FATIGUE + HEAVY BLOW = CONCUSSION. (Sulaiman 2017). This is problematic for a few reasons. Multiple times, Sulaiman has referred inquiries regarding this statement to individuals who are unable to present this study in its entirety. Additionally, at this time, as explained by Christina Newland for The Ringer, there haven’t been any standalone studies of the frequency or severity of concussions suffered by women in boxing, nor have there been comparative studies expressing a correlation between less time in a round and less concussions in boxing (Newland 2018). His explanation regarding bone structure in the neck region doesn’t even appear to reflect the partial consensus regarding why women are more prone to concussions (see Makin’s 2018 article on the size and structural differences in male/female axons), but it does sound more convincing in a boxing context, which was almost certainly a strategic choice. In a boxing match, a heavy blow can be landed at any point in the fight. Changing the length of the rounds cannot eliminate the risk of a concussive blow landing. Additionally, as Newland explains, reducing round time from three minutes to two minutes may just allow for more punches to be thrown within that limited time frame (2018). Limiting rounds to two minutes is also a major deterrent for anyone seeking to get the most bang for their buck in terms of pay-per-view events. Why would you shell out for 20 minutes of action when men’s boxing events regularly provide 36? Every fighter is aware of the potential risk of permanent brain damage associated with boxing. The risk of a knockout is arguably the largest draw for casual boxing fans. Limiting or removing this risk inevitably creates less of a desire to watch the fight. Additionally, removing women’s choice to risk concussions for increased visibility as men freely do follows a deeply patriarchal pattern of men systematically infringing on women’s equality. Sulaiman references several other sports and the way that they accommodate women with shorter match length, more protection, etc., but Sulaiman isn’t a representative for any of them. Yes, his responsibility should be the safety of fighters, but also ensuring that fighters have equal opportunities for self-promotion, financial success, and legacy building under the WBC banner regardless of gender. Basically, the actual effects that less time and less rounds has on the health of female boxers is as unclear as it has ever been, but the effects on the popularity of women’s boxing is obvious. Vasyl Lomachenko, another two-time Olympic gold medalist draws in over a million viewers (Doran 2018) while Claressa Shields drew in less than half of that in her Showtime fight against Hannah Gabriels (Idec 2019). Of course, various factors such as promoters and hosting networks should also be considered, although when Lomachenko fought Nicholas Walters on HBO, 761,000 viewers tuned in which limits the extent to which premium vs basic cable can be considered a major factor. It’s clear that none of the major governing bodies have put in the time, resources, or effort to conduct sport specific studies to determine the best way to ensure that women fighters remain safe while still being entitled to the same levels of success as male fighters. Why not pay for actual studies on whether the two-minute limit is actually effective? Why not invest in gloves that are designed for the safety of the brain rather than the hands? This could reduce to risk of a concussion to the levels of risk that men experience. If female boxers wish to achieve the same level of success as men in the sport, these kinds of questions need to be raised. As long as women have less round time, less actual rounds, and are perceived to be taking less of a risk, men’s boxing events will be viewed as the more logical investment. Lastly, as boxing fans, why wouldn’t we want to see a broader range of fighters, more potential matchups, and more unique personalities in boxing? Removing the barriers that prevent women’s boxing from achieving the same levels of interest as men’s boxing garners would be in our best interest as viewers as well and we should all be on board in this effort. Doran, Niall. “Lomachenko vs Linares Pulls Big Numbers On TV.” Boxing News and Views, Last modified May 16, 2018. https://www.boxingnewsandviews.com/2018/05/16/lomachenko-vs-linares-pulls-big-numbers-on-tv/. Idec, Keith. “Shields-Gabriels Drew Peak Viewership of 410K on Showtime.” BoxingScene.com. Accessed April 15, 2019. https://www.boxingscene.com/shields-gabriels-drew-peak-viewership-410k-on-showtime–129462. Makin, Simon. 2018. “Do Brain-Wiring Differences Make Women More Vulnerable to Concussions?” Scientific American Mind 29 (2): 8–11. doi:10.1038/scientificamericanmind0318-8. Newland, Christina. “The Biggest Fight in Women’s Boxing Is Over a Minute.” The Ringer. Last modified July 11, 2018. https://www.theringer.com/2018/7/11/17550554/women-boxing-wbc-round-length-restriction. Sulaiman, Mauricio. “WBC President: Two Minute Rounds for Women Is Safety, Not Sexism.” WBN – World Boxing News, Last modified April 18, 2017. https://www.worldboxingnews.net/2017/04/18/two-minute-rounds-for-women-is-safety-not-sexism-says-sulaiman/.